Make powerful reports using any financial data. Fast and easy. 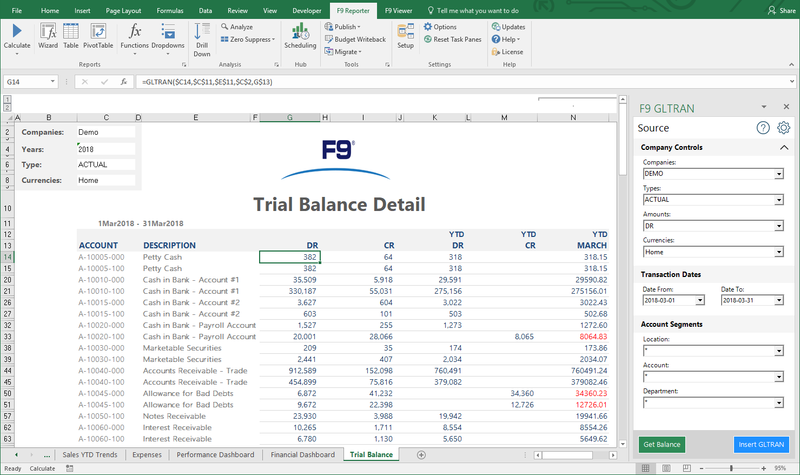 F9 Report Writer is an easy-to-use financial reporting tool that dynamically links financial data to Microsoft Excel and is available for over 150 different accounting and ERP systems. 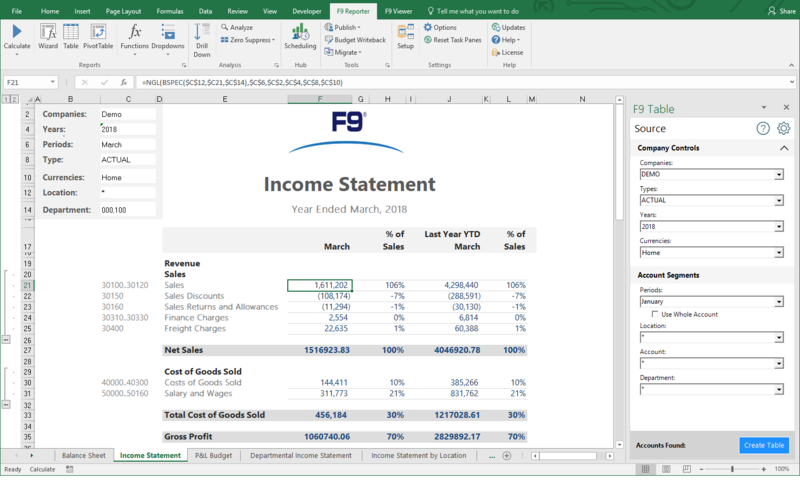 Everything you know about your spreadsheet can be applied to the reports you create using F9 Report Writer. 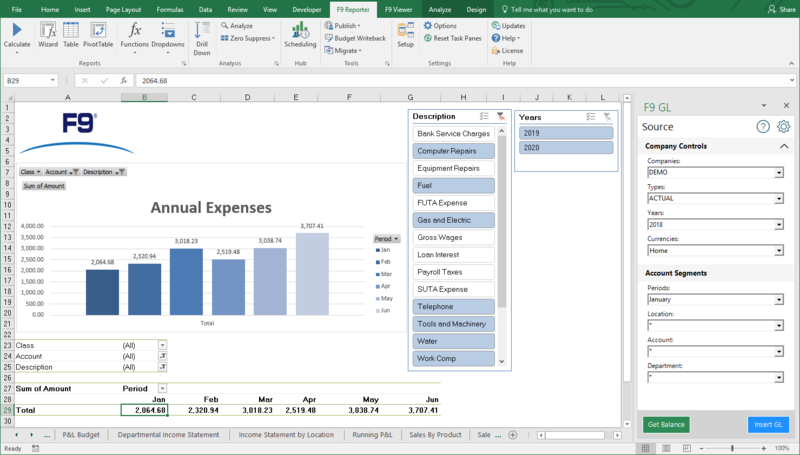 Use Excel's functionality to add graphs, buttons and backgrounds to your reporting systems. 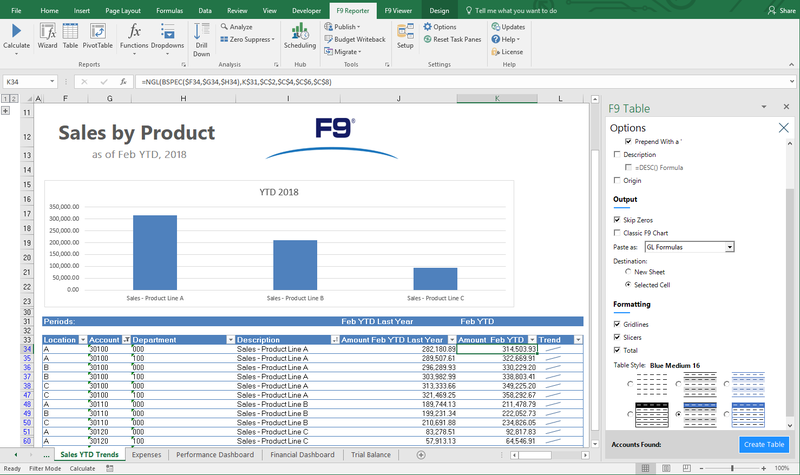 You already know how to use your spreadsheet, therefore, you already know how to use F9. Stop wasting valuable time on redundant building and rebuilding of reports. With F9 you’ll spend that valuable time analyzing financial data and overall business performance. Once a report is designed, recalculating a report is as easy as pushing the F9 key. The true value of F9 becomes apparent when you realize the scope of reporting functions that become available with this one simple GL function. Consolidate financial data that do not share the same account structures or are from different accounting systems. All with the push of a button. F9 does all of this through a dynamic link to financial data, ensuring that all numbers are timely, consistent, and complete. You will never have to manually create and customize your spreadsheets again. With a few simple steps you will be able to create the reports you need quickly and easily. You can manipulate your reports and refresh simply by clicking the F9 key on your keyboard. F9 allows you to create financial reports the easy way, and without technical help. Define and design your report quickly and easily through drop-down menus and graphics. Within minutes, you can create any report required - whether a summary or detailed - for any designated date range; a day, a week, a weekend, whatever makes sense for your particular business. Watch how F9 Report Writer helps our customers build their reports with confidence.